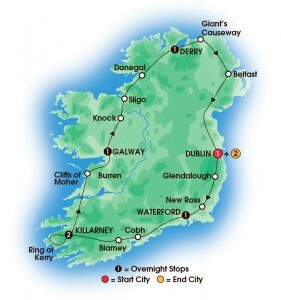 Dublin open-top bus tour with a visit to Guinness Storehouse, Teeling Distillery, EPIC Ireland or the General Post Office Museum. Tour begins 2:00 PM, Dublin hotel. Meet your guide at your Dublin hotel and set out on an introductory tour of central Dublin. City highlights include elegant 18th century Georgian houses with brightly-painted doors, tranquil parks and the wide O’Connell Street. Enjoy a guided walking tour through the campus of Trinity College to view the illuminated manuscript of the Book of Kells. In the evening join your group for a welcome drink to discuss your trip then enjoy an independent dinner at one of Dublin’s many restaurants or pubs. Relax and enjoy the delightful scenery of the Wicklow Mountains on the way to Glendalough, one of Ireland’s most beautiful destinations. Explore the remains of one of the most important monastic sites in Ireland, founded by St. Kevin in the 6th century. Walk through the deep valley to view the picturesque ruins of a round tower, churches and Celtic crosses. Continue south to New Ross to the Dunbrody Famine Ship, a reconstructed 19th century vessel showing the harsh sailing conditions for emigrants on the way to North America. Relax as you continue to Waterford. After dinner, take a short walking tour through Waterford with a local guide. Walk along Merchant’s Quay where ships docked in former times and see the Clock Tower, Reginald’s Tower, City Hall, Theatre Royal and many other places. Witness the creation of crystal masterpieces during your visit to the House of Waterford Crystal. Travel via Dungarvan to Cobh, the last port of call of the Titanic. A walking tour will reveal many of the places that still remain over a century since travelers embarked on that fateful voyage. 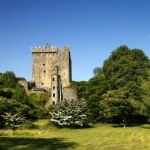 Head to nearby Blarney Castle to kiss the “Stone of Eloquence” or to explore the tranquil gardens. Treat yourself to authentic Irish products at the Blarney Woollen Mills before continuing west through picturesque countryside to Killarney. This evening, join your fellow travelers for dinner in the hotel restaurant. 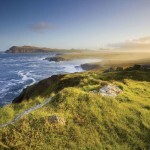 Enjoy the highlights of Ireland’s natural scenery on the Ring of Kerry route. The road winds between the Macgillycuddy’s Reeks Mountains on one side and the Atlantic coastline on the other. Travel through Killorglin and Cahirciveen to cross the bridge to Valentia Island. Visit the Skellig Experience, which explains the life of early Christian hermits on Skellig Michael, a rocky offshore island, and was featured in the “Star Wars VII” movie. Enjoy a casual lunch and stop in the pretty village of Sneem. Pause at Moll’s Gap for panoramic mountain views. Enjoy the evening in Killarney for dinner on your own and perhaps a visit to one of the town’s many lively pubs. Immerse yourself in Irish farm life during a visit to an authentic working farm and watch trained sheepdogs round up mountain sheep. Follow the shoreline of Donegal Bay to Donegal town and past the lovely Blue Stack Mountains to Derry. On arrival in Derry meet a local guide to discover the history of this ancient city. This evening, enjoy dinner in the hotel restaurant. 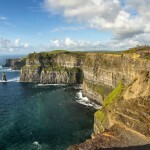 Travel along the scenic coastline, stopping for photos at the sprawling ruins of Dunluce Castle. Marvel at the majesty and mystery of Giant’s Causeway, enormous hexagonal columns formed by volcanic activity over 60 million years ago. The huge rocks have given rise to many stories about Finn McCool, a legendary giant. Head to Titanic Belfast where interactive galleries bring the tragic Titanic story to life. Stop just south of Dundalk at the charming Glyde Inn, which dates back to 1770, for a farewell dinner with Irish specialties and traditional entertainment before continuing to Dublin. Spend a day in Dublin with an independent Dublin open-top bus tour (valid for 48 hours) and a visit to one of Dublin’s top attractions — Guinness Storehouse, Teeling Distillery, EPIC Ireland or the General Post Office Museum. This bustling city has plenty of museums, shops, and parks you may also enjoy visiting. In the evening you are free to dine at one of the many restaurants and pubs that Dublin has to offer.